Le Puy-en-Velay ([lə pɥiɑ̃vəlɛ]; Occitan: Lo Puèi de Velai [lu ˈpœj ðə vəˈlaj]) is a commune in the Haute-Loire department in south-central France near the Loire river. Its inhabitants are called Ponots. The city is famous for its cathedral, for a kind of lentil, and for its lace-making. Le Puy-en-Velay was a major bishopric in medieval France, founded early, though its early history is legendary. According to a martyrology compiled by Ado of Vienne, published in many copies in 858, and supplemented in the mid-10th century by Gauzbert of Limoges, a certain priest named George accompanied a certain Front, the first Bishop of Périgueux, when they were sent to proselytize in Gaul. Front was added to the list of the apostles to Gaul, traditionally sent out to reorganize Christians after the persecutions that are associated with Decius, circa 250. As with others of the group, notably Saint Martial of Limoges, later mythology pushed Saint Front and the priest George back in time, and tells how George had been restored to life with a touch of Saint Peter's staff. The expanding legend of this St. George, which, according to the Church historian Duchesne is not earlier than the 11th century, then makes that saint one of the Seventy Apostles of the Gospel of Luke, and tells how he founded the church of the [civitas] que dicitur Vetula in pago Vellavorum—as the settlement of Ruessium began to be called during the 4th century: the city "called Vetula in the pays of the Vellavi" was how a document of 1004 termed it. Vetula means "the old woman", and pagans were still making small images of her as late as the 6th century in Flanders, according to the vita of Saint Eligius. This was the first cathedral at Le Puy. Following St. George the founder, later medieval local traditions evoke a legendary list of bishops at this chief town of the pays of Le Velay: Macarius, Marcellinus, Roricius, Eusebius, Paulianus, and Vosy (Evodius), all of them canonized by local veneration. It will have been from Bishop Paulianus that the Gaulish settlement of Ruessium/Vellavorum received its Christianizing name, Saint-Paulien. A bishop Evodius attended the Council of Valence in 374. In the early 1180s peasants of Le Puy, led by a carpenter named Durandus, formed a conspiratio (sworn association) called the Capucciati (because of the white hoods they wore as a sign of their conspiratio). They challenged seigneurial dominance in a short lived attempt at reformation. The Christianization legends of Mons Anicius relate that at the request of Bishop Martial of Limoges, Bishop Evodius/Vosy caused an altar to the Virgin Mary to be erected on the pinnacle that surmounts Mont Anis. Some such beginning of the shrine Christianized the pagan site that became the altar site of the cathedral of Le Puy. It marked one starting-point for the pilgrim route to Santiago de Compostela, a walk of some 1600 km, as it still does today. The old town of Le Puy grew around the base of the cathedral. Pilgrims came early to Le Puy, and no French pilgrimage was more frequented in the Middle Ages. Charlemagne came twice, in 772 and 800. There is a legend that in 772 he established a foundation at the cathedral for ten poor canons (chanoines de paupérie), and he chose Le Puy, with Aachen and Saint-Gilles, as a center for the collection of Peter's Pence. Charles the Bald visited Le Puy in 877, Odo, count of Paris in 892, Robert II in 1029, and Philip Augustus in 1183. Louis IX met James I of Aragon there in 1245, and in 1254 when passing through Le Puy on his return from the Holy Land he gave the cathedral an ebony image of the Blessed Virgin clothed in gold brocade, one of the many dozens of venerable "Black Virgins" of France. It was destroyed during the Revolution, but replaced at the Restoration with a copy that continues to be venerated. After him, Le Puy was visited by Philip the Bold in 1282, by Philip the Fair in 1285, by Charles VI in 1394, by Charles VII in 1420, and by Isabelle Romée, the mother of Joan of Arc, in 1429. Louis XI made the pilgrimage in 1436 and 1475, and in 1476 halted three leagues from the city and walked barefoot to the cathedral. Charles VIII visited it in 1495, Francis I in 1533. The legendary early shrine on the summit of Mons Anicius that drew so many would seem to predate the founding of an early church of Our Lady of Le Puy at Anicium, which was attributed to Bishop Vosy, who transferred the episcopal see from Ruessium to Anicium. Crowning the hill there was a megalithic dolmen. A local tradition rededicated the curative virtue of the sacred site to Mary, who cured ailments by contact with the standing stone. When the founding bishop Vosy climbed the hill, he found that it was snow-covered in July; in the snowfall the tracks of a deer round the dolmen outlined the foundations of the future church. The Bishop was apprised in a vision that the angels themselves had dedicated the future cathedral to the Blessed Virgin, whence the epithet "Angelic" given to the cathedral of Le Puy. The great dolmen was left standing in the center of the Christian sanctuary, which was constructed around it; the stone was re-consecrated as the Throne of Mary. By the 8th century, however, the stone, popularly known as the "stone of visions", was taken down and broken up. Its pieces were incorporated into the floor of a particular section of the church that came to be called the Chambre Angélique, or the "angels' chamber." It is impossible to say whether this St. Evodius is the same person who signed the decrees of the Council of Valence in 374. Neither can it be affirmed that St. Benignus, who in the 7th century founded a hospital at the gates of the basilica, and St. Agrevius, the 7th-century martyr from whom the town of Saint-Agrève Chiniacum took its name, were really bishops. Duchesne thinks that the chronology of these early bishops rests on very little evidence and that very ill-supported by documents. Before the 10th century only six individuals are known of whom it can be said with certainty that they were bishops of Le Puy. The first of these, Scutarius, the legendary architect of the first cathedral, dates, if we may trust the inscription which bears his name, from the end of the 4th century. Adhemar, bishop of Le Puy was a central figure in the First Crusade. Pope Clement IV was also bishop of Le Puy. Though the ancient diocese was suppressed by the Concordat of 1801, it was re-erected in 1823. 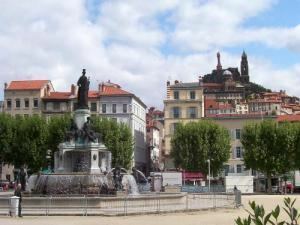 Le Puy-en-Velay's most striking attraction is the Cathédrale Notre-Dame du Puy, dating chiefly from the first half of the 12th century. The façade, striped in courses of white sandstone and black volcanic breccia, is reached by a flight of sixty steps, and consists of three orders, the lowest composed of three high arcades opening into the porch, which extends beneath the first bays of the nave. Above it are three central windows that light the nave, and above them are three gables on the gable-end of the nave, flanked by two openwork screening gables. The south transept doorway is sheltered by a Romanesque porch. Behind the choir rises a separate Romanesque bell-tower in seven storeys. The bays of the nave are roofed by octagonal cupolas, the cupola at the crossing forming a lantern; the choir and transepts are barrel vaulted. The striking parti-colored cloister is connected to remains of 13th-century fortifications that separated the cathedral precincts from the rest of the city. Near the cathedral, the 11th-century baptistery of St John is built on Roman foundations. 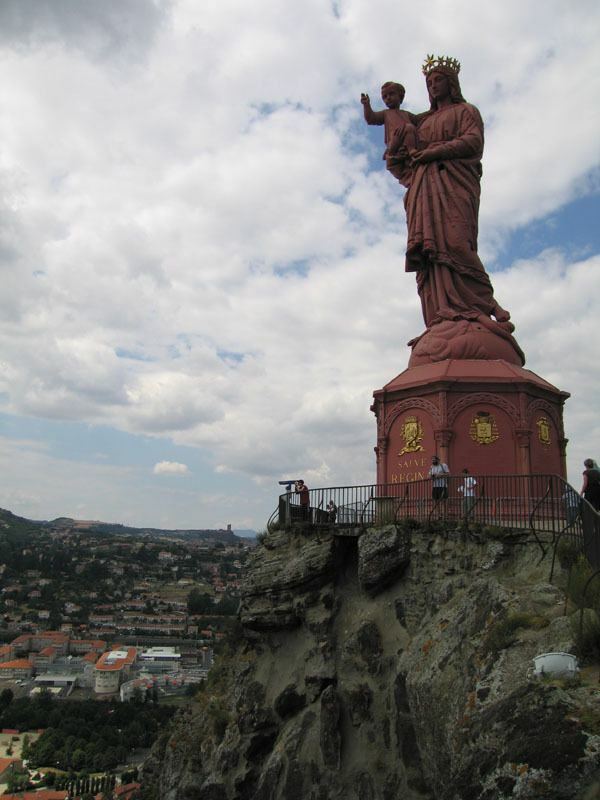 The iron statue of Notre-Dame de France (The Virgin Mary) overlooking the town was designed by the French sculptor Jean-Marie Bonnassieux, and is made from 213 Russian cannons taken in the Siege of Sevastopol (1854–1855). It was presented to the town on 12 September 1860 in front of 120,000 people. Three miles from Le Puy are the ruins of the Château de Polignac, one of the most important feudal strongholds. Each morning, pilgrims gather to be blessed before starting their journey to Santiago de Compostela. The cathedral has been a Unesco World Heritage Site since 1998, as part of the "Routes of Santiago de Compostela in France". Fountain Crozatier is also a beautiful sight in the centre of the town. Auguste Aymard (1808–1889), prehistorian, palaeontologist. Le Puy is famous for a particular strain of green lentils and for its green liqueur "Verveine" flavored with verbena. The lentils, grown on the thin soils of the area, are very small and almost black in colour. Their unique quality and flavour derive from their high protein and relatively low carbohydrate content. They are widely used in soups and also to accompany goose, duck and sausage dishes. Le Puy green lentil (Lentille Verte du Puy) is an appellation recognised throughout the European Union (Protected Designation of Origin). The town holds a famous jubilee in years when the feast of the Annunciation falls on Good Friday. The Jubilee of Le Puy (see Jubilè du Puy-en-Velay in the French Wikipedia) occurred last in 2005 and will occur next in 2016, but the subsequent occurrence will not be until 2157. The Jubilee of Le Puy is the oldest aside from those of Rome and Jerusalem, taking its original cue from the statement of a monk Bernhard who predicted the end of the world in 992 when the feast of the Annunciation would fall on Good Friday. 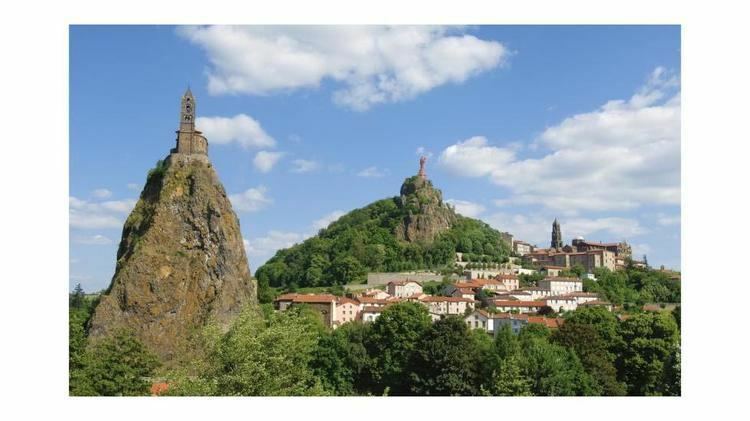 The number of pilgrims to Le Puy was so remarkable that, after the dread date had safely passed, Pope John XV declared that each such date would be marked by a Jubilee.The first such anniversary occurred in 1065. In the Jubilee of 1407, the press of the crowd was so great that two hundred pilgrims suffocated. Of three Jubilees in the 20th century, the Jubilee of 1932 attracted over 300,000 pilgrims. Le Puy has hosted the Tour de France on six occasions. In 1954, it was the finish town of stage 15, from Millau, which was won by Dominique Forlini. The next day, Jean Forestier won the race from Le Puy to Lyon. The race did not return until 1990, when the riders retraced their predecessors' route to Millau. Marino Lejarreta won the day. In 1996 the town again hosted two stages, stage 12 from Valence, won by Pascal Richard, and stage 13 to Super-Besse, won by Rolf Sørensen. Most recently, Giuseppe Guerini won the stage from Issoire in 2005. The city last hosted the tour in 2017.